Tate, driving the Lori and Mike Jones-owned U-9 Les Schwab Tires, physically finished second on the race course but was awarded the win when Jimmy Shane and the U-1 Miss HomeStreet was hit with a one-minute penalty for going below 80 mph twice during the pre-race milling period. The victory was the sixth of Tate’s short three year career and the eighth for the Jones Racing Team. 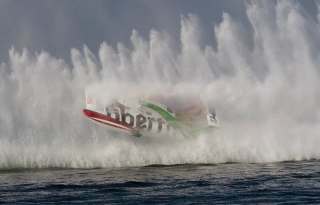 It also allowed him to increase his lead in the H1 Unlimited Hydroplane Racing Series National High Points Standings to 1,998 over Shane and the U-1 Miss HomeStreet with just two races to go in the season. Tate knew that he was going to have his hands full in the final against the new U-1 Miss HomeStreet craft, which had an impressive debut with three heat wins, including one against Tate. Tate was outside of Shane in lane four at the start of the heat and was behind when the two drivers cleared the first turn. Shane slowly began to pull away when the penalty was announced on lap three. With Shane now relegated to fifth, Tate had little trouble in pulling away for the win. J. Michael Kelly finished second in the U-12 Graham Trucking with Brian Perkins placing third in the U-21 PayneWest Insurance. Rookie Aaron Salmon was fourth in the U-99.9 CARSTAR powers Miss Rock. The first running of the final heat was stopped after Cal Phipps suffered a 360-degree blowover in his U-1918 Oberto Beef Jerky. Tom Thompson appeared to cut off Phipps as the pair entered the second turn of the first lap causing Phipps to ride up the roostertail of Thompson’s U-11 Diamond Reliable Tool presents J&Ds. The U-1918 Oberto landed right-side up and Phipps quickly exited the craft uninjured. The H1 Unlimited Hydroplane fleet will now swing back east for the annual Gold Cup in Detroit Aug. 24-26.